Kevin Howell, Director at CIH Cymru, is here to talk the roof over your head. Bricks and mortar. HOUSES. If you’re struggling to find a home and care about the lack of affordable housing in Cardiff, read on about this campaign! Finding it hard to save for a deposit to buy your first home? Struggling to find a house share in the location you want? Living with the folks, but desperate to move out? Stuck in a home no longer suitable for your growing or shrinking family? If you answered yes to any of the above, then you are a victim of the housing crisis. In Wales, house prices have increased by more than six times the average person’s income since 2008. Experts say we need to build 12,000 new Welsh homes a year. Last year we built just 6,955 hew homes; better than the year before, but far from what we need. Across Wales the need for new homes is not distributed proportionally. It’s estimated that Cardiff requires nearly 30 per cent of the total projection. If you are already struggling to find a home in Cardiff, it’s likely going to get worse. My organisation, the Chartered Institute of Housing, has joined up with several others – including Community Housing Cymru, Welsh Tenants, the Residential Landlords Association and Shelter Cymru, who agree that the housing crisis affects us all and the only solution is a political solution. In Wales, the National Assembly (our law-making body – elections are coming up in May for this, folks!) has shown a great level of interest in housing, and the Welsh Government has shown good leadership in the last five years. It has introduced new housing laws, regulations and opportunities including tenancy reform, mandatory private landlord licensing, Help to buy Wales (supporting people to buy their homes), bringing empty homes back into use, and introducing a UK-first homelessness prevention duty, and all with cross party support. I’m passionate about building on this progress, making sure that housing is a top priority for the next Assembly term too. The solution to the crisis is more investment and continued recognition of the role our homes play in our lives, in our economic, social and environmental wellbeing. Tell a friend about Homes for Wales. We want to end the housing crisis and build a stronger Wales. Housing is about much more than bricks and mortar – it is about people, communities, and infrastructure. 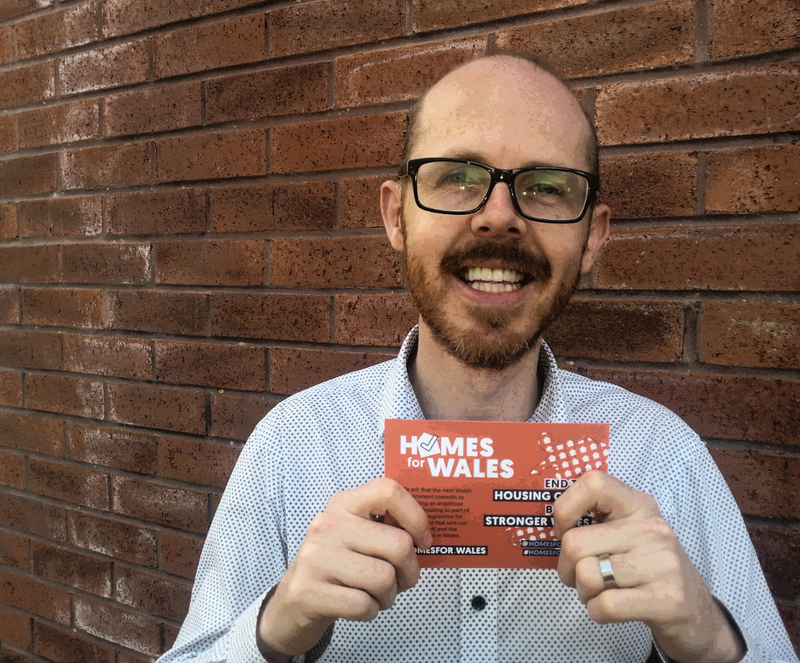 Please add your voice to the Homes for Wales campaign; the more the merrier, the louder and the stronger! I’ll see you at the rally. The Homes for Wales rally begins at 13.00 on Friday 4 March 2016, at the Senedd. The rally will march to the Hayes for an afternoon of campaign activity and fun. More information on the Homes for Wales website. ← Total Recall! Newport2Calais Refugees Fundraiser Film Night! 5 March!